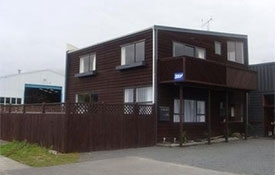 The Alpine Motel & Backpackers Lodge has 9 well-appointed ground-floor units, from Studio units to spacious self-contained Chalets. 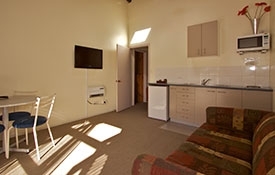 All of our units have Sky satellite TV and 32" LCDs for your viewing pleasure. 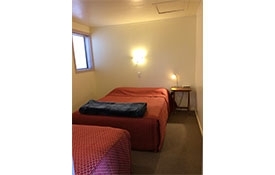 A modern and warm studio unit featuring a 32" LCD Sky Satellite TV, WiFi internet, telephone, kitchenette with microwave, tea/coffee and toast-making facilities and ensuite bathroom. 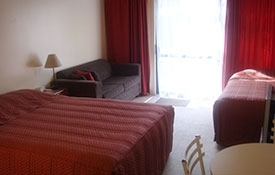 A single room with 1 queen-size bed, 1 single bed, plus a sofa bed with quality linen and electric blankets. 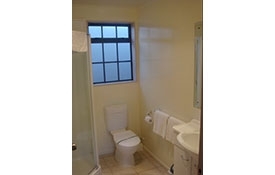 A spacious 1-bedroom unit featuring an ensuite bathroom and kitchenette with microwave, electric frying pan, toast, tea and coffee-making facilities. Lounge area with Sky Satellite TV, telephone and WiFi internet. 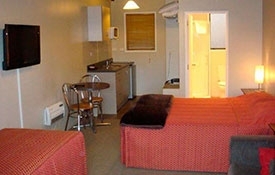 Bedroom with 1 queen-size bed and 1 single bed. Lounge has a sofa bed. Quality linen and electric blankets. 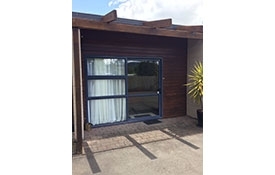 A large family unit featuring full kitchen facilities with oven, lounge/dining area with Sky Satellite TV, telephone, WiFi internet and ensuite bathroom. Sleeps up to 8. 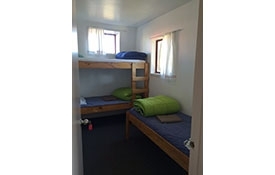 Mezzanine floor has 3 sets of bunks (6 single beds). Ground floor has 1 queen-size bed. Quality linen and electric blankets. 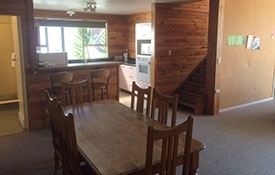 A 2-bedroom, 2-story chalet featuring full kitchen facilities, lounge/dining area with Sky Satellite TV, telephone, WiFi internet and ensuite bathroom. Sleeps up to 9. Upstairs bedroom 1 has a double bed. 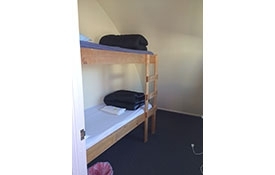 Upstairs bedroom 2 has a set of bunks and 1 single bed. 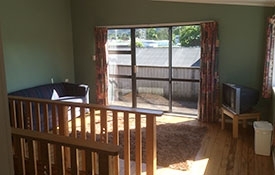 Downstairs has 2 single beds and 1 sofa bed. 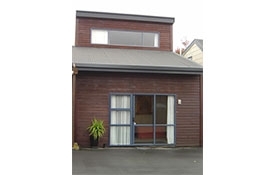 A 2-story, 4-bedroom townhouse ideal for groups and families. Sleeps up to 14. 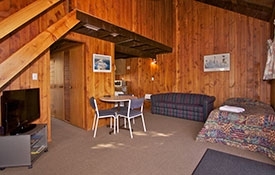 Spacious lounge/dining area with satellite TV and fireplace downstairs and a second lounge area upstairs with satellite TV. 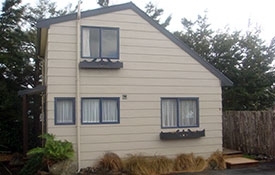 Kitchen features wall oven, microwave, dishwasher, cooking utensils, cutlery and crockery. 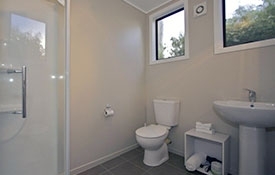 The house also has a bathroom downstairs and separate toilet and shower upstairs. Upstairs bedroom 1 has a queen-size bed. Upstairs bedroom 2 has a queen-size bed. 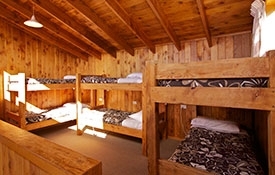 Upstairs bedroom 3 has 2 sets of bunk beds (sleeps 4). Upstairs lounge has a double sofa bed. Downstairs bedroom has a double bed. Downstairs lounge has a double sofa bed. 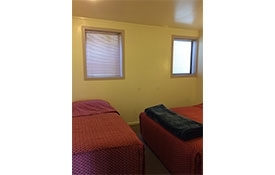 A 2-person bunk room in our backpacker lodge with shared bathroom, lounge and fully equipped kitchen facilities plus access to the motels drying room and laundry facilities. One set of bunk beds made up with bottom sheet, quilt, pillow and pillowslip. Towels available for hire. 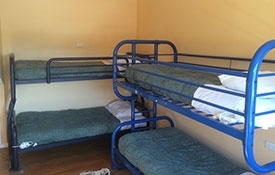 A 3-person bunk room in our backpacker lodge with shared bathroom, lounge and fully equipped kitchen facilities plus access to the motels drying room and laundry facilities. A single set of bunk beds plus 1 single. All beds made up with bottom sheet, quilt, pillow and pillowslip. Towels available for hire. 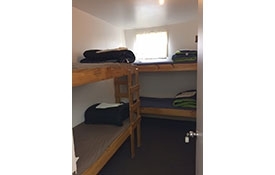 A 4-person bunk room in our backpacker lodge with shared bathroom, lounge and fully equipped kitchen facilities plus access to the motels drying room and laundry facilities. Two sets of bunk beds made up with bottom sheet, quilt, pillow and pillowslip. Towels available for hire. 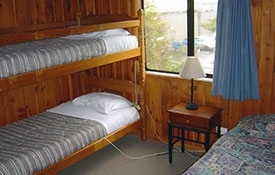 2-person set of bunks, in a dorm room. 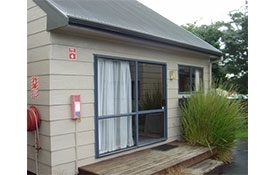 With shared bathroom, lounge and fully equipped kitchen facilities plus access to the motels drying room and laundry facilities. A single set of bunk beds made up with bottom sheet, quilt, pillow and pillowslip. Towels available for hire. 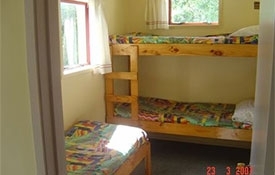 The Backpackers Lodge is made up of bunk rooms for 2, 3 or 4 people with shared facilities and a communal kitchen. 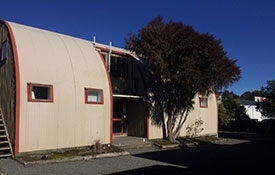 Backpacker guests have access to the spa pool (subject to availability via the booking board) and laundry and drying room facilities.